ALL OF THE IMAGES IN THIS GALLERY ARE AVAILABLE FOR SALE AND CAN BE MADE INTO PRINTS, SHOWCASED ON A CANVAS, PRINTED ON HOUSEWARE ITEMS AND/OR WORN ON T-SHIRTS. I HAVE WATERMARKED THE IMAGES FOR SECURITY PURPOSES, BUT THE WATERMARK WILL NOT APPEAR ON ANY PURCHASE. IF YOU SEE ANY IMAGE IN ANOTHER GALLERY, AND WOULD LIKE TO PURCHASE IT, JUST LET ME KNOW AND I WILL UPLOAD THE IMAGE INTO THIS GALLERY FOR YOU. 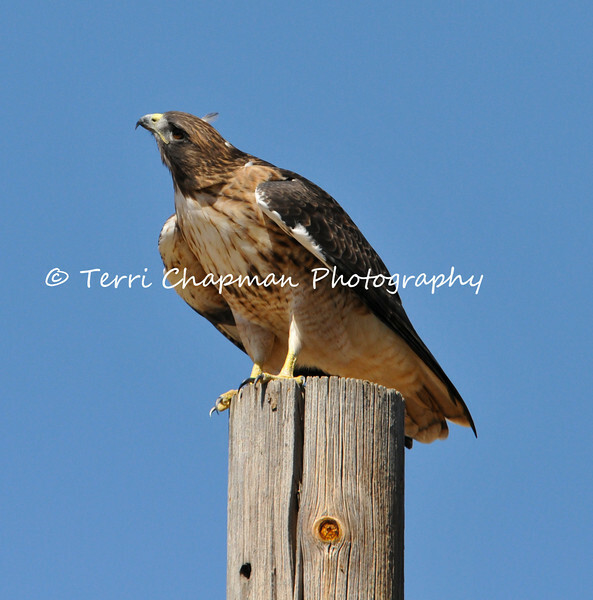 This image is of a Red-tailed Hawk perched on top of a telephone poll and watching a group of small birds flying in the area. I love the one feather that is sticking out on the top of his head. The Red-tailed Hawk is a bird of open country. Look for it along fields and perched on telephones poles, fenceposts, or trees standing alone or along edges of fields as it searches for the movements of a rodent or a rabbit.